This is going to be kind of a shotgun style post. We got a new build on the beta servers today and I haven’t had much time to explore everything yet. But here are a few observations/impressions. They added a lot of stuff and took away some others. On the plus side they added the faction rewards for the Shado-Pan, the Klaxxi, Golden Lotus, and the August Celestials. The Shado-pan will sell you cool panther mounts when you’re exalted with them. 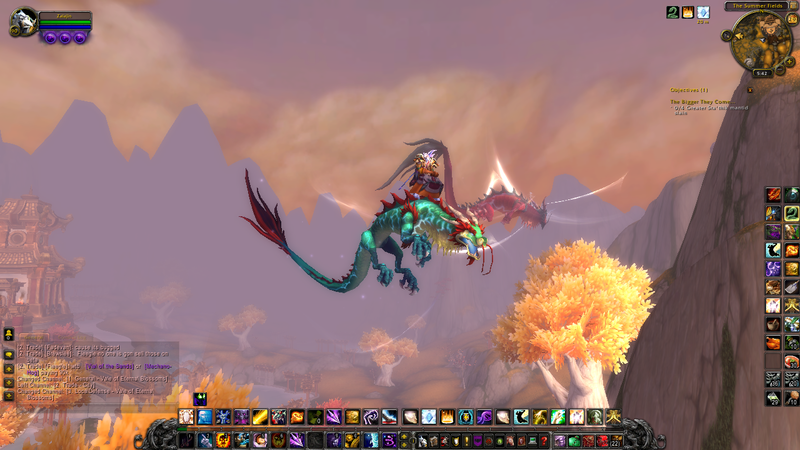 The Celestials sell the Thundering Cloud Serpent mount (see the screen shots above). You also need exalted rep to purchase that. With those faction rewards added to the mix it’s going to be very easy to gear up for raiding. MMO-Champion has a list of everything here. On a sad note they took Pet Battle training away from everyone who previously purchased it. That, along with some blue posts recently, tells me that we’re going to see that enabled pretty soon. I hope so because I was having a blast searching Azeroth for new and interesting pets. They gave everyone on beta a Crimson Pandaren Phoenix mount to test out. Similar to the rocket mounts that we got last week. They just showed up in everyone’s inventory. I guess they want everyone to test them really well. I did get revered with the Anglers today and bought a nice little fishing raft. 21,000 rep to go until I can get the water-strider mount. The Yak fund is coming along nicely. As I said last post I have the cash to buy the mount. Now I’m just getting some more money so that I’m not completely broke after. Besides I love playing the action house. And I’m trying some new techniques that I’ve never used before. Basically automating some stuff with Trade Skill Master. Oh yeah, one more thing, Motes of Harmony are dropping from mobs now. You combine 10 of them to get a Spirit of Harmony for crafting. The motes seem to drop a lot more than the Spirits of Harmony were dropping previously.